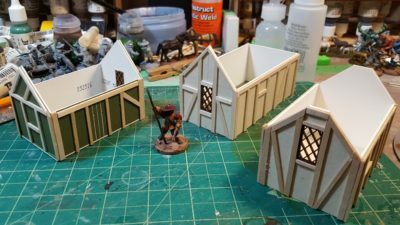 Wargaming terrain & scenery posts. This is diorama-level scenery building, but almost everything he does in this video is applicable to wargamer-proof terrain too and the final result looks awesome. Paepercuts is a great channel; he was quiet for a while but has been putting out new stuff regularly now and is well worth the subscription over on YouTube. One of the comments in the Savannah video describes the host of these as “the Bob Ross of scenery videos” and I realized that’s one of the things I like about him, there’s none of the “HEYYYYYYY GUYSSSSSSSSSSS” weird loudness that is apparently standard issue in far too many other YT videos. As for me and my house, I’m still not doing much gaming-related stuff but I can feel the new-project itch starting up. 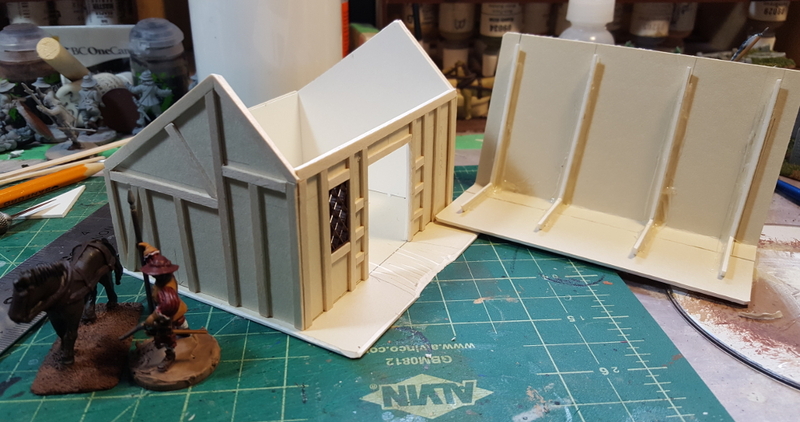 This might be something completely different, away from the various 28mm projects I’ve spent time on the last five years or so. Possibly Russian Civil War at a grand tactical small scale, 6mm or even 2mm/3mm for that “miles of open steppe” feel… we shall see! Trumpeter Salute is next month in Vancouver and for the first time in years I’m not running a game but I’m still really looking forward to being there. Trumpeter has been great for blasting the wargaming cobwebs off in past years, we’ll see what it does this time around! 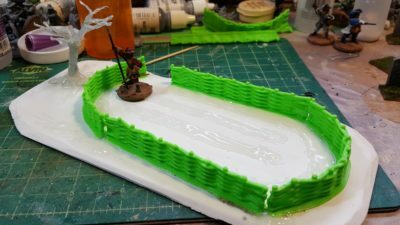 Modular River, Part Seven: Resin Complete! Hope everyone had a good Labour Day long weekend, if that’s a thing for you, and a good return to school, if that’s a thing for you and your family! My hobby time has been really minimal the last while, both because the weather has been awesome, and because of whole piles of family stuff going on, both good and bad. I’ve nevertheless managed to get the last of the resin water poured into the river modules, and touch up some of the earlier pieces done with epoxy glue with a skim of pourable resin to improve and harmonize all the water on all the segments. The two corner pieces done with epoxy had gone quite matte when the glue cured fully, not like the full gloss the resin retained. A ten segments (and the pond test piece) laid out on my floor. Click for larger. Another mediocre picture of my floor, but the only passable shot I have so far of all ten segments all at once. Click for larger. Not quite done with these river segments yet, though. The ends of each segment needs cleanup. There’s bits of blu-tak that have bonded to the resin and will need to be scrapped off, a little bit of overflow resin to carve off, and most of the segments have little ridges at each end where the resin has crept up the tape-and-craft-stick dams at the ends of the segments. I’ll need to carve those off carefully with a sharp knife, and might need to mix a tiny batch of resin to patch a few bits. After that the flocking on the banks all needs to be re-done; I’ll just cover over the existing flock with a new layer after the thinned matte medium went all milky. Looking forward to getting this project done and onto the table during an actual game, it should look pretty damn good and I’m happy to finally have a high quality set of river segments at long last! Some of the segments laid out on my desk for inspection. You can see some of the bits of blu-tak on the ends, and the milky stains on the flocking. The water looks great, though! Click for larger. Gradual progress on pouring resin into the river segments, doing one segment every night. I work on an old plastic cafeteria tray and cover the tray with a box lid to keep out dust, cat hair, the cat, and other household sources of lint, dust, and fluff that will happily glue themselves to freshly poured resin. One ounce of resin (half an ounce each of resin and hardener) is enough for one of the long 12″ river modules, which makes for easy measuring. I bought a batch of disposable plastic 3oz shot glasses to mix the resin in, and those seem to be working out nicely so far. 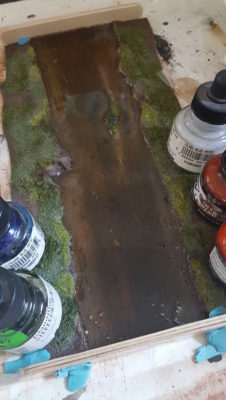 I add 8-10 drops of GW brown wash as I mix the resin, just enough to darken it a bit and add a bit more depth to the water effect. Between that and the shading I painted into the river bed sections I think I’ve gotten a reasonable feel of depth from a layer of resin that’s only about 1/8th” deep or so! Overhead view with some almost-finished Warlord firelock musketeers about to charge into the water. Click for larger. Lower view, nicely showing off the reflective surface of the resin. Click for larger. There’s a little bit of a lip on the ends where the resin has crept up the sides of the dams, but I’ll use a knife and wet sanding to get rid of that and a bit of gloss medium (or an additional dab of resin) to fix any scuffing from that process. 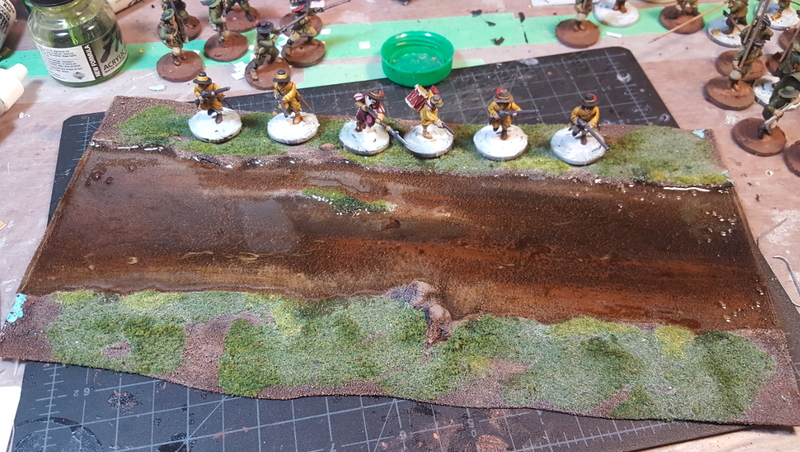 I need to scrape off or cover the bits of blu-tak that have been glued into place by the resin, too, but I’ll do that last while I’m fixing the discoloured flocking along the banks, the places where the resin has soaked up into the flock, and adding the rest of the foliage. Onward to the next resin pouring session! I had used basic hardware store 5-minute epoxy glue for the swampy pond test piece, and had more or less intended to just keep doing that for all ten river segments. 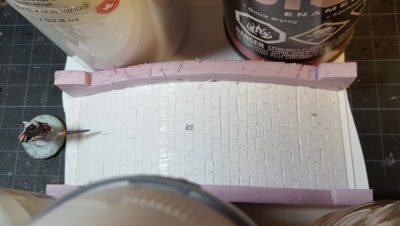 I did the two smaller corner/curve river segments as a further test, and was really irritated when one of them came out all lumpy and matte instead of glossy. Two corner segments done with 5-minute epoxy glue. Click for larger. I also realized that given the price of 5-minute epoxy, actual casting epoxy resin was actually going to work out cheaper for this whole project, especially given that 40% off coupons for large chains of craft stores are a thing! I picked up some EnviroTex Light Pour-on Epoxy from the aforementioned large craft store, for a total cost of about three more tubes of 5-minute epoxy after that useful discount coupon. First resin pour on one of the full-sized river segments! Click for larger. One US fluid ounce of resin nicely fills one of the full size 12″ long river segments; I could probably cut the quantity down just a bit, even. I did the resin pouring in an old cafeteria tray I use to help contain potentially messy projects. 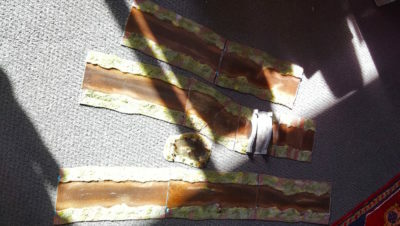 The dams at either end of the river segment are hardwood craft sticks (tongue depressors) wrapped in packing tape, secured with more packing tape from underneath the river segment and then further secured with blobs of blu-tak. I also pushed more blu-tak in along the edges of the river banks to block up possible gaps there. As far as I can tell everything has gone smoothly with this first pour; I did it last night in bad light, working on our back patio to keep from stinking the apartment up. The Pour-On product is much less volatile and stinking than 5-minute epoxy glue, though! I didn’t see any leaks onto the tray and everything seemed to be cured up OK when I checked this morning before work, too, although the material info does warn this stuff takes up to 72 hours to full cure. 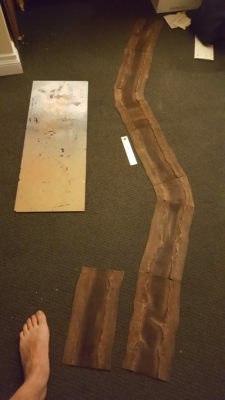 I’ve got seven river segments still to do water on – five more long straight pieces, the bridge, and the ford (both 6″ long) – so at one piece a day it’s going to be sometime next week before I can put the epoxy away. The resin is much, much more aggressively self-levelling than the epoxy glue. 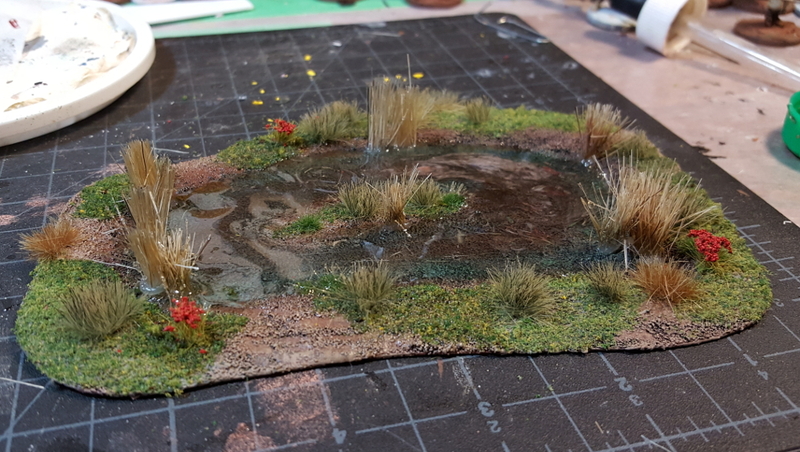 I might go back and do a few ripples with gloss medium just so the river water doesn’t look completely still and stagnant. 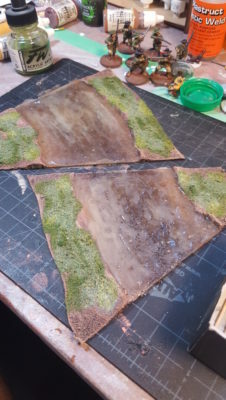 The one curved river segment that went all lumpy is going to get a very thin skim of resin to fix that and get a proper wet glossy look, as well. At that point, once all the epoxy has cured hard, I need to go back and fix the flocking along the river banks. If you look at both photos above you can see some white staining on the banks. 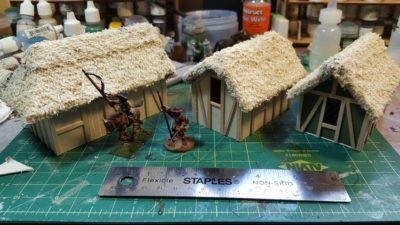 I put a coat of dilute matte medium over the flock, which I’ve used before many many times to properly secure flock and foliage on terrain pieces, and this time it left a distinct milky residue behind. I painted over that where it had stained the river bottom, and once the resin water is properly hardened I’ll re-do all the flocking to fix the discolouration there. I’ve never had a matte medium and water (or white glue and water) mix do this to me before, in years of using it to secure terrain material of all types. Any readers have any good ideas about what the heck happened here? Quick update on the river project! I’ve been taking a lot of summer holiday time recently, including all of last week away, so not a lot of progress or action, but there has been some, at least. 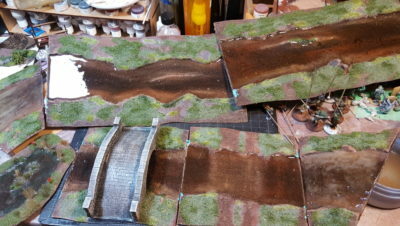 I’ve got all the river segments except the bridge basecoated and drybrushed up, ready for foliage and then water effects. All the river segments except the bridge all laid out on the floor. Click for larger. I snapped this photo after dark, so I apologize for the generally crap image quality, but it shows the current state of everything except the bridge. Black basecoat over the sand layer, then heavy brown drybrush on the banks and shallow bits and a lighter brown drybrush down the centre of the river channel. Finally a drybrush of tan on the banks and the shallow parts of the river channel. The bridge segment is a bit behind the others; it just got the black basecoat on the banks and channel so no picture for now as I didn’t want to put wet paint down on my carpet for some reason. The long straight sections are 12″ long, 6″ wide overall, and the river channel is 3″ with 1.5″ wide banks on either side. The short straight is intended to be a ford and is 6″ long; the two short curve segments are roughly 4″ or 5″ long on the long outside sides. 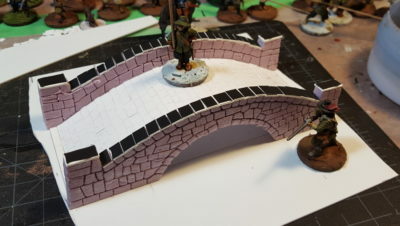 The bridge is on another 6″ segment, and the eventual plan is for different 6″ segments to add flexibility – a high tech bridge for my Infinity gaming will be one of the first, probably. Next up will be foliage and flocking along the banks, and then the smelly, messy business of resin water effects on the whole set! I started a pond as a test piece just before starting the whole river section project, and it’s been progressing one or two steps ahead of the rest of piece all along. 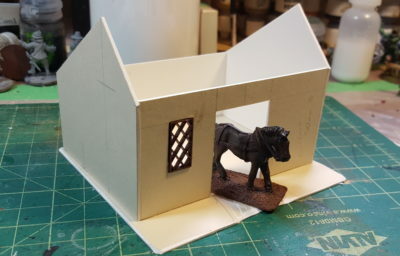 Like the river pieces, the base is sheet plastic styrene with air drying clay for banks, and it was then covered in fine sand before being primed black. It got painted and decorated with various foliage bits, and after letting all of that dry for a bit I tried out a new-to-me water effect with cheap resin 5-minute epoxy glue. 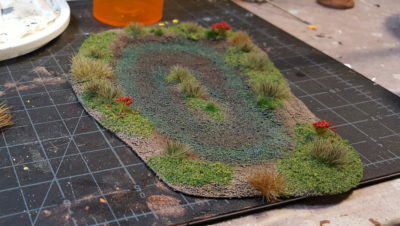 Pond all painted and foliage’d with flock, static grass, and tufts from various sources. Click for larger. For water I’m trying out ordinary hardware store 5-minute epoxy glue, as shown in one of Luke’s APS YouTube videos on water effects – this link is to the main channel page, as I can’t remember which of his water videos actually talks about epoxy glue for water. Sorry – will update if I find it! Anyway, I squeezed the 5-minute epoxy right into the pond bottom and mixed it with a scrap stir stick. There was a brief scare when it went all silvery while I was mixing part of it, but that cleared up right away, thankfully. I wound up using three overlapping small batches of epoxy to fill the pond to the current level, then left that for 24 hours to fully cure. The pond with the first batch of 5-minute epoxy water curing. Click for larger. It needs a bit more epoxy around the outer edges as the first pour didn’t get right in under and behind some of the reed bunches, but I’m really happy with how it’s going so far! For the second pour I’m going to try getting the epoxy glue a bit thinner by warming the dispensing syringe with a hot water bath before squeezing it out. Last time we saw the river modules, they were bare white plastic with clay banks. I’m happy to report that progress has been made! Sand and paint on the river modules, and paint on the bridge. Click for larger. Nothing fancy, just a coat of black paint mixed with some white glue, then sand shaken over while everything was still wet. I’ll put another coat of paint and glue over the sand to fully secure it, then get on with the rest. As seen in the photo above, the bridge is also fully painted. Over the black primer (mixed, as usual, with white glue) I blobbed two different green shades and some rust brown, then started drybrushing with a dark grey, a bit of tan, then lighter grey and finally just a bit of pure white on the edges and upper surfaces. Black primer coat with blotches of other colours. Click for larger. Drybrushing in progress, starting the greys. 28mm Warlord pikeman on the 25mm base to the right for scale. Click for larger. 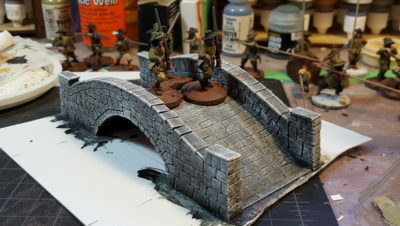 Bridge all painted, being guarded by a trio of Warlord 28mm musketeers. Click for larger. 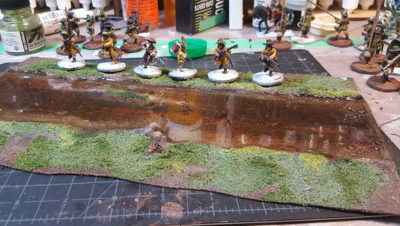 I’ll do the river banks alongside the bridge next, then paint and sand so all ten river segments are at the same stage, then it’s off to doing water effects, probably with epoxy resin. Realized I forgot to include the photo of the river modules with the air drying clay banks in place, so let’s start off with that! I rolled clay snakes out, mushed them into place, and left everything to dry. Clay banks in place on some of the river modules. Click for larger. On to the actual subject of this post, the bridge! 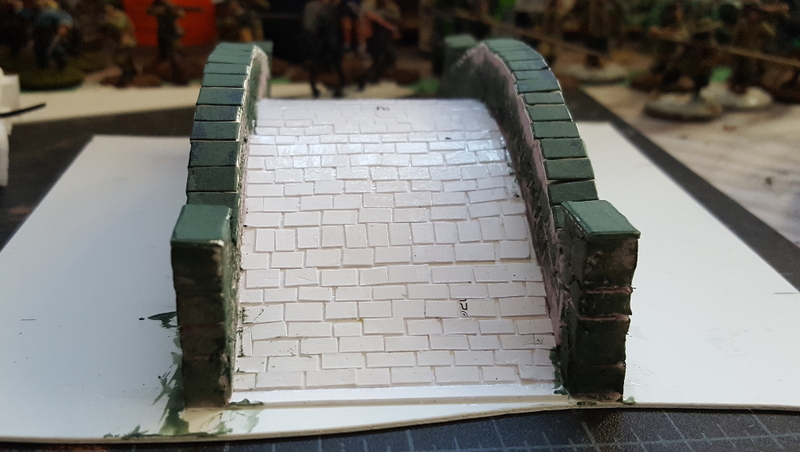 This river project is initially intended to go along with my English Civil War pike & shot project I’m painting figures for, so I started with a classic stone arch bridge. The base module is one of the two short river modules, so it’s 6″ long and 6″ wide. 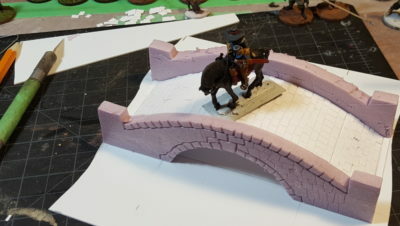 I decided to make the roadway portion of the bridge 50mm wide, which will fit at least two foot or cavalry figures side-by-side, or a wagon or vehicle. The whole bridge is roughly 5.5″ long, more or less. The roadway is three layers of light card (90lbs or so) laminated together with white glue and left to dry under a couple of heavy books. After that dried overnight I cut it to length to form the arch, then glued more small rectangles of light card to it for the flagstone bridge surface. While that was drying I superglued two little strips of card in place on the styrene base to hold the arch in place – you can see them at either end of the roadway in the picture below. These gave the roadway something to be braced against while I superglued it into place. The inner arch was formed similarly, although I only used a single layer of card as it won’t be exposed in the final model. For the sides I started with an offcut of one inch thick pink styrofoam insulation. 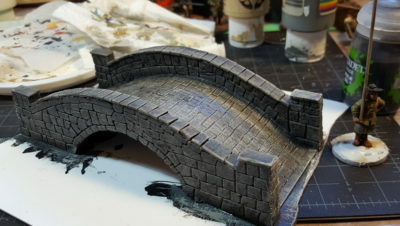 I marked the roadway and inside arches on the side of the piece with a pencil, then carefully cut the curves and the end pillars with a brand-new Xacto blade before slicing the entire piece in half lengthwise to get both sides of the bridge. They were glued into place with white glue – you can’t use superglue on styrofoam, it melts! – and braced with various heavy things overnight so they dried in place. 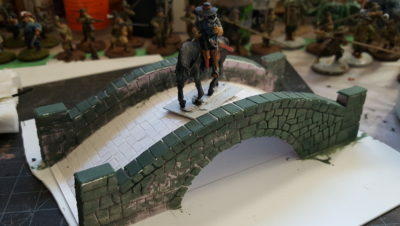 The bridge with sides held in place while the white glue dries, top-down view. 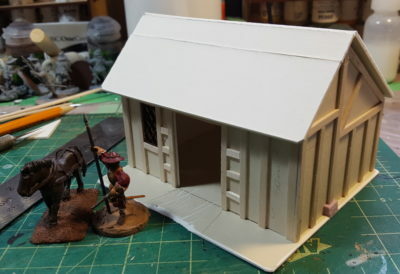 The figure on left is on a 25mm wide base. Click for larger. After the whole assembly had dried for about six hours or so I started carving the stone sides, using my usual combination of an Xacto knife and a pencil. 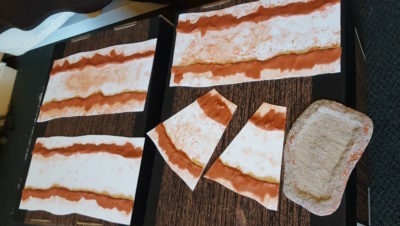 Cut patterns with the knife, then open up the cuts with the pencil for a nice easy stone effect. I also used a ball of tin foil to add a bit of stone texture to the sytrofoam; I might yet go back and add more to the parts that are still too smooth. Carving started on the walls of the bridge. 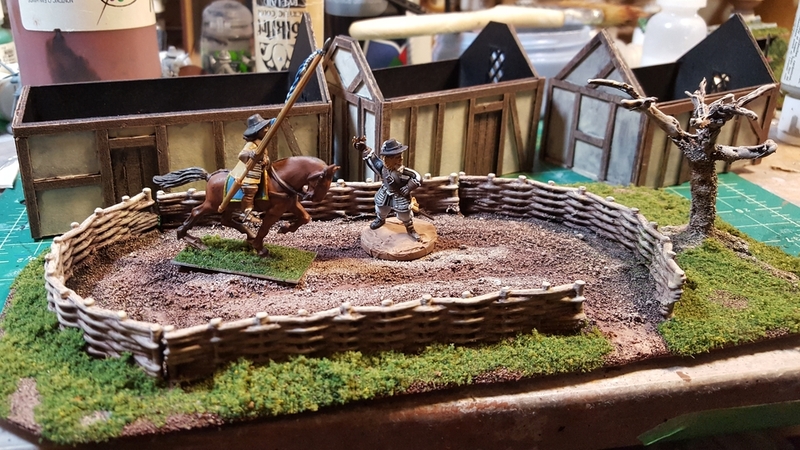 Horseman is on a 20mm by 40mm base. Click for larger. After doing the carving I decided to put a row of capping stones across the tops of the arches and pillars. Making them out of heavier matt board (picture framing card, one of my favourite building materials) means they’ll protect the styrofoam sides of the bridge, much the same way a harder stone like slate is often used to protect a more carveable stone! I cut a strip of matt board then chopped slightly different sizes rectangles from it, to make the result more varied and interesting. Cap stones in place on the arches and pillars. Click for larger. 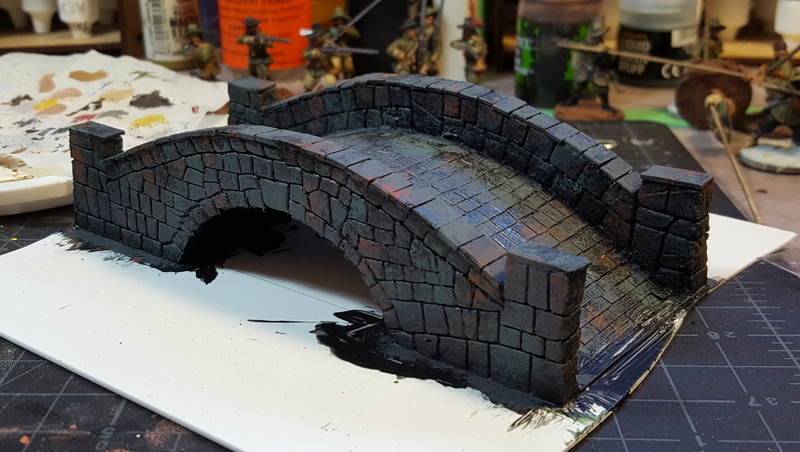 To add texture, especially to the card, and to help protect the whole structure a bit more, I put a coat of GW Liquid Greenstuff over most of the bridge and, for now at least, declared construction finished! I still need to do the river banks, obviously, and might yet add some small buttresses to the sides of the end pillars of the bridge. The stonework might need more texture, too, but I’ll wait until I get a primer coat of paint on it before making that decision. Liquid Greenstuff applied, bridge construction basically done. Click for larger. Finally, here’s a miniature eye shot (more or less!) of one end of the bridge looking up the roadway. 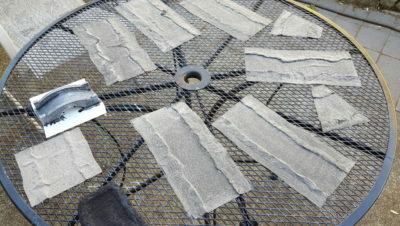 This shows the flagstones of the roadway nicely; I’m really pleased with how they turned out. Individual little rectangles of light card is a painful way to do flagstones, but it does look good! You can also see the card strip I glued down to brace the road arch in place; I’ll eventually cover that in clay or putty to disguise it as flagstones or hide it. Low level view across the bridge! Click for larger. 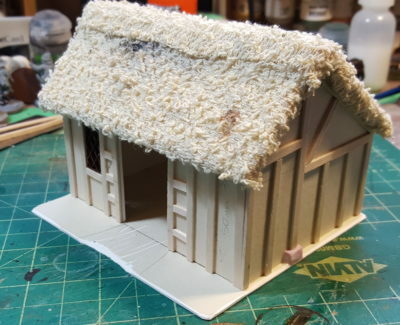 The main river modules are also proceeding, all the clay banks are straightened and glued down, so I might be able to get texture on them in the next few days, although we’re going to have a house guest in our spare room (usually my workspace/man cave) for all of this coming week!